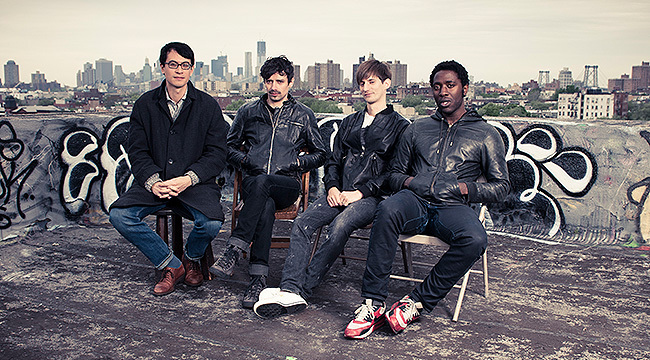 Bloc Party made a big splash when they released Silent Alarm. The British rockers’ 2005 debut was nominated for a Mercury Prize, British music magazine NME voted it “album of the year” and it even managed to sell a few hundred thousand copies in the States. Things were going well for the group but by 2009, the guys were burned out and needed a break. After some time off, they reconvened in 2012 to release Four, an album of taut, angular guitar riffs and aggressive vocals. We recently rang singer Kele Okereke in his San Diego hotel room to talk about the album and the current tour. Talk about your philosophy toward music. I think that’s something that fluctuates. I don’t know if we always are on the same page. I think we come from different worlds. That is maybe less apparent than when we started. We all have different musical identities. The one thing that binds us is that we trust each other. You might not always see eye to eye on everything, but it’s important that everyone expresses themselves. It’s a collaboration and everyone has to feel that they contributed. 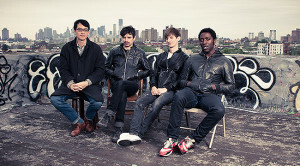 Was Bloc Party influenced more by British bands than American bands? I don’t know. I can only really talk about my influence. I think that although we are a British band, we’ve always been aware of and respected American rock and pop music. We don’t make a distinction about. It’s not about seeing ourselves as some kind of diehard British band. If anything, that mentality disgusts me. You take influence from everything that’s good. There’s plenty of great Japanese and Indonesian and African music. It’s not a national thing for us. You take influence from everything that’s good. Why did initial comparisons to Gang of Four bother you? Only in that I didn’t really know who they were. When I did find out who they were, I wasn’t that into it. I understand that people see things in your music that you might not see yourself. I understand that. To me, they aren’t an influence at all. I know they kind of were for one member of the band so I don’t want to completely disparage them. For me, the sounds that we were using seemed more current. The sounds that were exciting me were bands like Elastica, Blur, Pavement or Smashing Pumpkins. Four records in, people have an idea about what we are as a band. Your debut received mostly positive reviews and sold pretty well, too. What do you think critics and fans were responding to? I haven’t got any idea. For us, it was the first record we ever made and we just made a record. We locked ourselves away for that one month in Copenhagen and we made the record and released it. When it went on to connect to so many people, we were surprised as anyone else. We have an intensity to our music that maybe not so many other British bands have or had. That must have some impact. I have no idea what people see in what we do but I am glad that they do. Did that put a certain amount of pressure on the group for the follow-up? No. It’s like what I said before. We made that record without any thought about how it would be received and that’s how we’ve made every record. So long as the four of us are into it and expressing ourselves in the most honest way we can, that’s the only thing that matters. It’s about doing the best you can at the time you have. Once it’s done, you move onto the next one. There’s no point in thinking about how things were. Was there a chance that the group would split up in 2009 when it took a break? I don’t know. I feel that we had been on the road non-stop for five years. We’d release a record and then would go back into the studio for six months and then release another record and tour for a year. It was starting to feel like we were losing track of our lives. We needed some distance and space. That’s what we got. It was the best thing we did. Talk about what producer Alex Newport brings to the new album. He was great. He was a really unobtrusive presence. He knew we wanted to make something that felt lean and honest. He was constantly there to keep us on track. It was one of the nicest recording experiences we’ve had. We did in [former Smashing Pumpkins guitarist] James Iha’s studio in Chelsea, I think it is. It was nice. I was living in New York at the time. I was walking to the studio every day and it was a beautiful spring as well so it felt very easy. No. I met him once in a restaurant years ago and saw him at the studio. The only interaction I had with him was that one day he was coming up the stairs and I was coming down and we said hello. I’m a big Smashing Pumpkins fan. It was weird seeing the gold discs on the wall. I felt like a teenager being in the space. We wanted to make something abrasive and ugly sounding and quite lean. I don’t know if we got there, but it pushed us in a different direction. To me, the new album sounds more musically aggressive than previous efforts. I think it’s more of a confrontational record. We were listening a lot to [The Pixies’] Surfer Rosa and [Nirvana’s[ Bleach and White Pony by the Deftones. We wanted to make something abrasive and ugly sounding and quite lean. I don’t know if we got there, but it pushed us in a different direction. It’s weird thinking about some of the lyrics and how they’re some of the most aggressive and angry things I’ve ever sung but I was in a Zen place. I had been living in New York and was meditating. I had no worries at all and was living this semi-Bohemian lifestyle and waking up and wailing around and reading. I was in a good place. I don’t know where the anger comes from at all. You’ve been debuting some new songs on this tour. Talk about that. Do you plan to record an EP? Yeah, we are playing some new songs and just finished recording the tracks on this EP that is being mixed now. We hope something will be out by the end of the summer.